Waiting with anticipation like the calm before the storm, recruits of Company L stood in line to jump, pull and run their way through the obstacle course on one of the depot’s physical training fields March 5. The recruits were paired together to complete the course in utility uniforms, flak jackets and Kevlar helmets, carrying partial combat loads. They also used the buddy system to climb over logs and high bars. Recruits master the technique of using their legs their senior drill instructor’s name and platoon Platoon 3245, drill instructor, Co. L.
During the first of three training phases, recruits run through the obstacle course in their camouflage utility uniforms without carrying any other gear. In the third phase it gets tougher, and recruits must climb a 30-foot rope and carry added weight. The exhausted recruits must master the technique of using their legs instead of their arms to pull themselves up the rope. While touching the wooden beam at the top of the rope, each recruit yelled their senior drill instructor’s name and platoon number, announcing their victory. 3245, Co. K. "The (first and final) bars on the course were the most difficult." 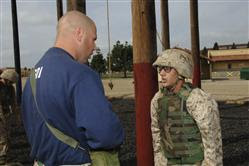 The recruits were also helped along the course by the motivating yells of their platoon drill instructors and the supervision of their company commanders who ensured the recruits used safety techniques throughout the course. Technique is important since the recruits must help one another finish the course with added weight, said Capt. Jeff Barber, series commander, Co. L.
Combat Fitness Test, said Jacobs. "It implements using teamwork in physically-demanding tasks," said Barber. The recruits will take on similar tasks in their final event as recruits: the Crucible – the final test of what they have learned. After completing the task, they will join the ranks of the Marines before them. Telephone Answering Services I get a lot of great information here and this is what I am searching for. Thank you for your sharing. I have bookmark this page for my future reference.